Spinning is one of the most popular indoor fitness activities throughout the world! Ride with your legs, your heart and your head! Be working towards a goal, have a target to give your ride real focus and meaning! If you are not sure of how to set up your bike your instructor will help you. If you are new to Spinning take it easy with your resistance dial, never let anyone adjust your resistance for you, you are in control of your ride! Throughout your ride you should be using different resistances and varying your leg speed. For hilly sections of a ride you should have a higher resistance and slower leg speed. For flat sections you should have a lighter resistance and faster leg speed. But remember - don't work flat out in every ride, sometimes you should finish leaving exhilarated and refreshed, with lots of energy for the next ride. Come with a goal in mind, it can be a goal for the class, a short/medium term goal, or a long term goal. Come equipped so you will be comfortable throughout the ride - padded shorts/seat covers, stiff soled shoes or clip in cycle shoes, breathable clothing, a towel and drinks bottle! Wear a heart rate monitor - so you know exactly what is happening in your body at any given moment. Your instructor should provide everything else you need for an enjoyable ride. 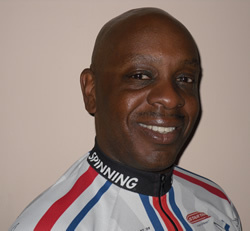 For more information about Spinning visit www.spinning.com, or for details of Bristol's first dedicated Indoor Cycling Centre hosted by UK Spinning® Team Presenter Les Antoine, click here.